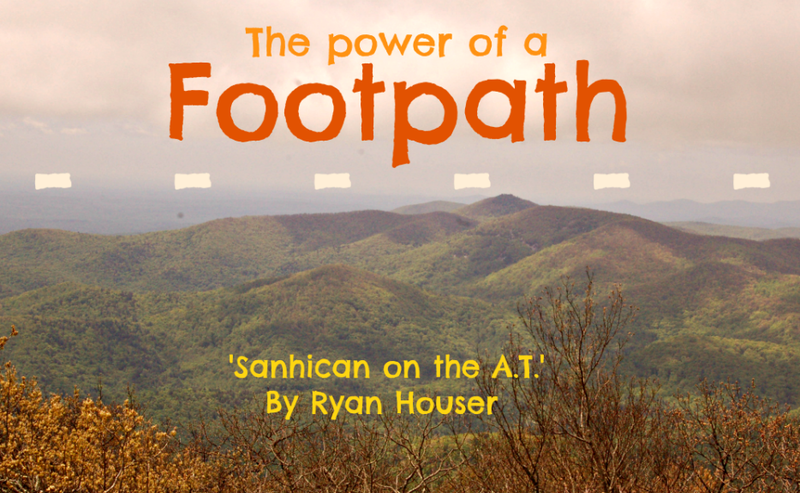 It wasn’t hard finding Eric Schwehm’s driveway, the northbound Appalachian Trail thru hiker from Troy that went by the name of “Sanhican” on the trail. Hiking poles were lodged into the ground by his mailbox and I spotted the “AT” sticker on the back of his car immediately. 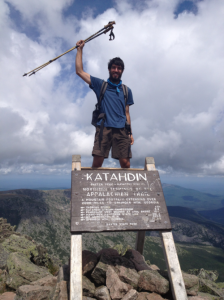 Schwehm was among the small percentage of Appalachian Trail thru hikers to complete the 2,184 mile trek last summer from Georgia to Maine, an undertaking that requires months of planning and an incredible mental and physical determination. Thru hikers have an immediate connection, almost as if they were friends in another life. There’s a mutual respect shared between the two, a true understanding of the trials and hardships each has faced on the trail. It’s a connection that even the closest family and friends won’t understand. Schwehm and I thru hiked the trail during the same season, but we never met. We just missed each other somewhere around Connecticut. On this November’s day in Troy we finally united. He invited me in for tea. A map of the trail hung on his refrigerator. A small black line marking the footpath wound its way through the states: Georgia, North Carolina, Tennessee, Virginia, West Virginia, Maryland, Pennsylvania, New Jersey, New York, Connecticut, Massachusetts, Vermont, New Hampshire and at last, Maine. We had so much to catch up on. Before I could even get my notes out the trail talk commenced. To most people, AT talk might not make much sense, but to Schwehm and I it might as well be our native language. Guidebooks and journals Schwehm kept during his trek lay scattered across the kitchen table, the pages worn and water damaged. They sure looked like they had been carried 2,000 miles. We sat there over them and talked for four hours. Unlike myself, Schwehm had previous extended backpacking experience before he started his thru hike. Growing up near Readington, N.J. Schwehm hiked some of the AT there as a boy scout. When he was 17 he hiked the whole section of New Jersey with a friend over Easter break. “It was about that time that the idea of thru hiking the entire trail came to me,” said Schwehm. Even so, it would be a while before he took that first step in Georgia. He joined the Navy after high school and went on to work most of his life in the military, spending time in the Army Reserve and Marine Corps. Schwelm moved to Troy in 2009 to take gunsmithing at MCC. In September 2011 Schwehm realized that he “needed some time to think” and decided to finally pursue the dream that had been in the back of his mind most of his life: to hike from Georgia to Maine. To say the climbs on the AT are arduous would be an understatement. In addition to being rugged and rocky, hardly resembling a trail at all at times, the AT always seeks the highest point. It traverses hundreds of named peaks, establishing the trail saying that “If you aren’t sure which way the trail goes, it probably goes up.” Efficiency is not part of the trail’s design. It’s inherently and intentionally difficult. 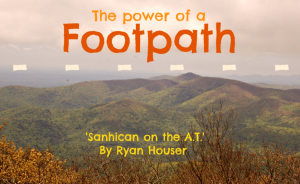 Put it this way: the total elevation gain necessary to thru hike the AT is roughly equal to climbing Mt. Everest 16 times. An estimated 5 million steps are necessary to complete the whole trek. An estimated 80 percent of those that make the attempt fail. In preparation for his trek, Schwehm read all the AT books he could get his hands on, researched thru hiking on whiteblaze.net and did practice hikes on the Uwharrie Trail to test gear. On March 5, 2012, his wife Jerieanne drove him to Springer Mountain in Georgia to see him off. “I started out heavy,” said Schwehm, whose pack weighed about 40 pounds. Some of the items Schwehm carried was a standard Eureka tent, books that he read at night and a cell phone in case of emergencies and for calling home. “One of the oddest items I had was a backscratcher that was made of bamboo,” said Schwehm. Schwehm started the trail alone but he soon formed friendships with other hikers and began hiking with a few groups. “Tug” and “Wahoo” were two retirees he hiked with. He also spent time with a “Beaker” and “Fival”, then in another group with “Omish” and “Chiba.” Schwehm refers to the younger hikers he formed friendships with as his “trail children”. “Sanhican” was chosen by Schwehm as his trail name. “It was a boy scout lodge we used growing up and the Native American meaning is ‘Firemaker,’” said Schwehm. It was amazing to see how our hikes compared. Schwehm and I had stayed in many of the same shelters and hostels. Devoured food at many of the same restaurants. Even met many of the same hikers. Trail names and faces that had faded into the back of my mind were suddenly brought back to life at his first mention of a name. “Yeah I met Sparrow! I hiked three days with him through Massachusetts,” I claimed. Schwehm spoke fondly of the trail towns he visited. “I especially liked the ones that the trail went right through, like Hot Springs, N.C. and Damascus, V.A.” More often than not however, thru hikers have to find their own way into towns, which can be anywhere from 2 to 15 miles off the trail. The most common method is hitch hiking. Some of the wildlife Schwehm recalls from his trip were bears, rattlesnakes and moose. He says Vermont was his favorite state. “The people there were awesome and the trail was beautiful.” As far as his least favorite section, Schwehm pointed to the Dragon’s Tooth in Virginia, a rock scramble that comprises some of the toughest trail in the southern Appalachians. Schwehm also ran into snow in the state. “I woke up to a few inches one morning in Virginia,” said Schwehm. Schwehm took days off from the trail here and there along his trip, taking a few days off in June for his wife’s graduation from MCC, a few in New Jersey to visit family and friends and a few in New Hampshire to see his brother, among other “zero” or rest days in various trail towns. Schwelm night hiked numerous times during his trek, downing energy drinks and continuing to follow the blazes long after the sun went down. “I also did some cowboy camping,” said Schwehm. This entails sleeping “under-the-stars” style with no tent or tarp cover. “Slackpacking” was also a technique Schwehm tried. This is when somebody, either a friend, hostel owner or outfitter employee, helps hikers complete a “supported” section by shuttling their gear for them further along the trail, allowing hikers to use just a day pack for that section and carry less weight. In reference to the mentally lowest point Schwehm had on the trail, he said, “I think for me it was near the end. I was just pushing my body too hard and it was letting me know it.” The last 100 miles of the trail in Maine, known as the 100-Mile Wilderness, doesn’t allow hikers to resupply until they reach Millinocket, a town just on the border of Baxter State Park. Baxter contains the northern terminus of the trail at the summit of Mt. Katahdin, arguably the toughest climb on the AT. On Sept. 13, 2012, Schwehm completed the trail. It had taken him 192 days. During the trek he lost over 30 pounds. His wife Jerieanne met him in Maine to pick him up. “My pack stunk so bad on the way home, we double bagged it in garbage bags and tied it to the roof,” said Schwehm. Schwelm says that he wants to do more hiking in the future but doesn’t have plans to do another long distance hike just yet. As I left his driveway late that night, Schwehm saw me off. “See you later Quicksilver!” he yelled. It’s amazing the power a footpath can have to bring people together. I knew I had made a friend. Ryan “Quicksilver”Houser is an accomplished hiker, blogger and reporter who just hiked, blogged and reported (on said blog) his way from Georgia to Maine. Check out his tumblr right here!